The Recording Academy’s GRAMMY Recordings and Atlantic Records have revealed the track listing for the 2017 GRAMMY® Nominees album. Set for release on Jan. 20 in stores and via digital retailers, the latest installment of the best-selling series — now in its 23rd year — features a collection of GRAMMY-nominated music for the upcoming 59th Annual GRAMMY Awards®.,. A portion of album proceeds benefit the year-round work of the GRAMMY Museum Foundation™ and MusiCares Foundation® — The Recording Academy-affiliated charitable organizations focused on music education programs and critical assistance for music people in need. 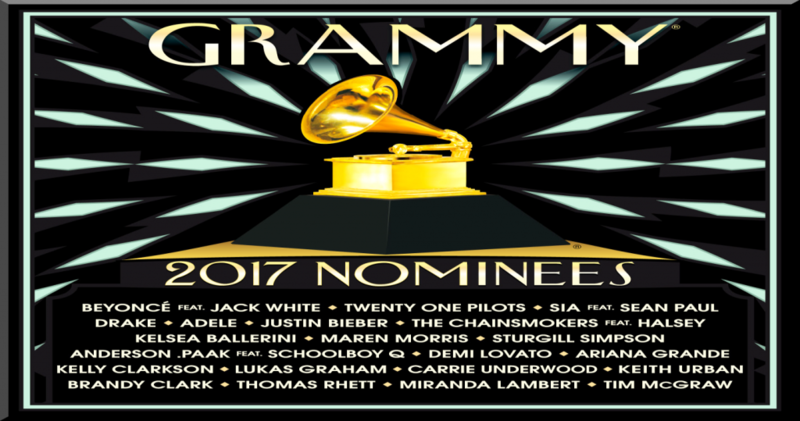 The 2017 GRAMMY Nominees album is highlighted by 21 hits from the world’s biggest superstars and hottest emerging talent, including Album Of The Year nominees Adele, Beyoncé, Justin Bieber, Drake, and Sturgill Simpson and Best New Artist nominees Kelsea Ballerini, The Chainsmokers, Maren Morris, and Anderson .Paak among others. Music fans can log on to 2017GRAMMYAlbum.com or CBS.com/GRAMMYs through Jan. 19 to pre-order the 2017 GRAMMY Nominees album, and enter for a chance to win a trip for two to the 59th Annual GRAMMY Awards. The 59th Annual GRAMMY Awards will be held on Sunday, Feb. 12 at STAPLES Center in Los Angeles, and will be broadcast live on CBS at 8p.m. ET/5 p.m. PT).